Crude oil prices have spiked following Israeli Prime Minister Benjamin Netanyahu’s allegations of Iran’s clandestine nuclear development. 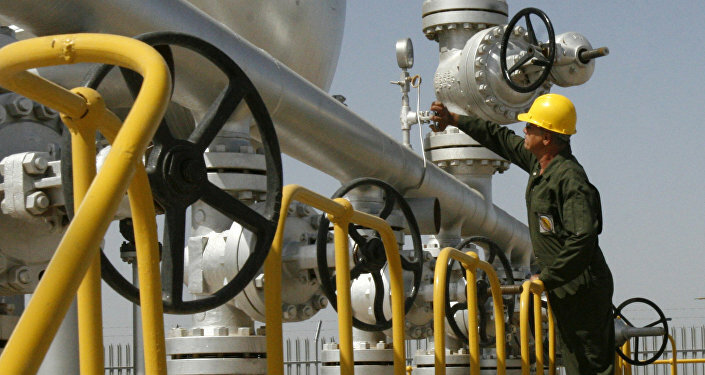 Experts say the oil market is particularly sensitive to any developments on the nuclear deal and sanctions. Sputnik discussed this with Michael Poulsen, an oil analyst at Global Risk Management Ltd.
Sputnik: In your view why has the oil market reacted so sensitively to the announcement made by Netanyahu? Michael Poulsen: It’s no doubt that the oil market has fresh in mind what happened the last time sanctions were imposed on Iran removing one million barrels from the world market and that had quite a big impact on prices and availability of oil. Sputnik: Is it likely that the gains in oil prices will be sustained or will they drop back down? Michael Poulsen: That’s the million dollar question. I'd say as long as the tension is ongoing, prices will be supported and there’s also a lot of other factors but it is definitely one of the things that are supporting prices for now, should it continue prices are likely to stay around current levels or even a tad higher. Sputnik: If the US introduces additional sanctions on Iran what impact can the loss of Iranian oil production have on the global oil market in general, you’ve mentioned a couple of points, but can you give us an overview of what your thoughts are? Michael Poulsen: Depends, of course, exactly on the amount of sanctions that are imposed but assuming it’s the same as last time around then it will be about a million barrels per day. Some portion of that potential loss of oil availability has already been built into prices. That’s also why they’ve jumped upwards, but I would say between $5 and $10 per barrel higher from where we are now is certainly a possibility. Sputnik: What countries would be impacted the most from this loss, obviously, apart from Iran, the producers which countries are they exporting their oil to, who’s buying their oil, who's friendly towards Iran when it comes to oil purchase? Michael Poulsen: Mainly countries in Asia that are dependent on Iranian oil, of course, depending if they can obtain a waver as stated for some portion of it last time around, then there will be less of an impact, but they’ll have to find the oil elsewhere. Sputnik: What other countries are most likely to make up for the lost Iranian oil supplies? Are we talking about the usual suspects Russia and America, will they pick up the slack? Michael Poulsen: That’s one option at least and also the Saudi‘s have some spare capacity but it's likely it will take a little bit of time to get everything up and running to account for a million barrels a day, it’s quite a hefty thing to lift from one day to the next, so there will likely be some overlapping period where those facilities are being used. Sputnik: What’s your take on the consequences? Can this have a positive effect on the US economy, the global economy or is it likely to have more of an adverse effect? Michael Poulsen: It’s still uncertain what effect it would have on the US economy they're already exporting whatever they can at the moment. So I would think they would have a hard time making up for another one million barrels, if that’s what potentially could snap back on sanctions, and then there would likely be other countries making up for that loss in Iranian production. Adding more barrels to the market, obviously, put a lid on prices but not as much as the lid being taken away by the deal within OPEC and non-OPEC for the 1.8 million barrels per day in crude production that’s also been running for 18 months, give or take, at the moment, that’s definitely supported prices as well. Sputnik: President Trump tweeted his distaste at the price of the barrel of oil recently, is he right in making his statements? Is what he is saying — the price of oil rather high at the moment in terms of production availability? Is he making sense or is it just another way of scaremongering the industry? Michael Poulsen: It’s difficult to say exactly whether the price is too high or too low, the price is what the market is willing to pay despite there being a cut deal within OPEC and non-OPEC countries. So whether the price is too high or too low that’s basically up to the market to decide we've seen them both higher and significantly lower than what we are currently.